A controversial energy farm has been prosecuted for spilling effluent into the River Kirk. Crouchland Farms Limited, based off Rickmans Lane in Plaistow, appeared at Worthing Magistrates Court on Friday (September 30). At court, the operator pleaded guilty and was fined £4,000, ordered to pay £3,917 and a victim surcharge of £120. The incident was first brought to the attention of the Environment Agency on December 2 2013. They received a report that a tributary of the River Kird at Kirdford was contaminated with dark brown effluent and investigations traced the source of the pollution to Crouchland Farms Limited and its director confirmed that an incident had taken place following the spreading of dirty water and diluted slurry from the farm on a nearby field which then resulted in the effluent being washed into the stream. Environment Agency investigations found that 13 kilometres of the stream had been polluted and that fish and river life had suffered, over seven kilometres, as a direct result of this incident. The sediments from such a pollution can also have a long-term adverse impact on a watercourse, taking years for it to recover. Following the incident, a detailed investigation was needed to conduct a thorough examination of the incident itself and all of the operations on site, together with interviewing various witnesses and carrying out long-term environmental monitoring of the affected area. 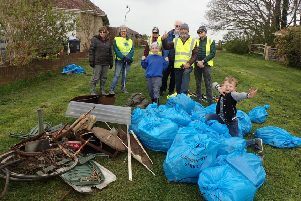 After the sentencing, Leon Mekitarian, Managing Director for Crouchland Farm said: “There are few things more important to us than looking after the local environment, so that we and our local community can enjoy it. “I’d like to apologise on behalf of all of us at Crouchland Farm, and the contractors that were employed at the time, for what took place. The magistrates presiding accepted that the effluent spill significantly caused damage to the local environment. Michael Turner of the Environment Agency said: “We used all our available regulatory powers to ensure the operator took the necessary action required to clean up the pollution. “I am very grateful to the local community for all their help and assistance throughout our investigation. “This was a totally avoidable incident as Crouchland Farms Limited were fully aware of the risks associated with the handling and spreading of farm effluent.